As the construction industry in the U.S. recovers, more residential and commercial projects dot the landscape. Professional welders with comprehensive welding training and relevant skills play an important role in both types of construction projects. However, there are differences between residential and commercial construction and the welders’ respective function and duties. Welders earn more than some other construction workers, whether assigned to residential or commercial projects. According to U.S. News, those with a professional welding background, such as plumbers, structural metal workers and sheet metal fabricators have among the highest wages in the construction industry. Annual salaries for plumbers, pipefitters and steamfitters, for example, can be as high as almost $50,000 1, according to the BLS. Geography – Wages usually are higher in larger city-metro areas and coastal locations than in rural or inland areas. Skills – Abilities acquired by thorough welding training and on-the-job practice help welders become more valuable to employers. Experience – Workers gain proficiency over time, once they put their training and education to work on real-time construction projects. The various specialties within the welding trade may influence wage scales. Another factor impacting wage levels is the benefit package offered by the union or employer. Residential construction welding training and tasks typically focus on plumbing issues, such as joining pipes for carrying water or natural gas. Employment in residential construction tends to be non-union and short-term. The Houston Chronicle points out that the welding work required for steel reinforcement of a hillside farmhouse may only last two to three weeks. However, welders working in residential construction typically enjoy more variety as they take on several different projects within a year. Commercial construction projects, on the other hand, are normally undertaken by larger construction firms that offer union employment. Depending on the size and purpose of the building, commercial construction typically uses more metal components; this requires more skilled welding professionals. Larger or technologically-advanced commercial buildings often need more electrical conduit, more extensive plumbing designs and more complex HVAC systems, which also calls for more experienced welding professionals. 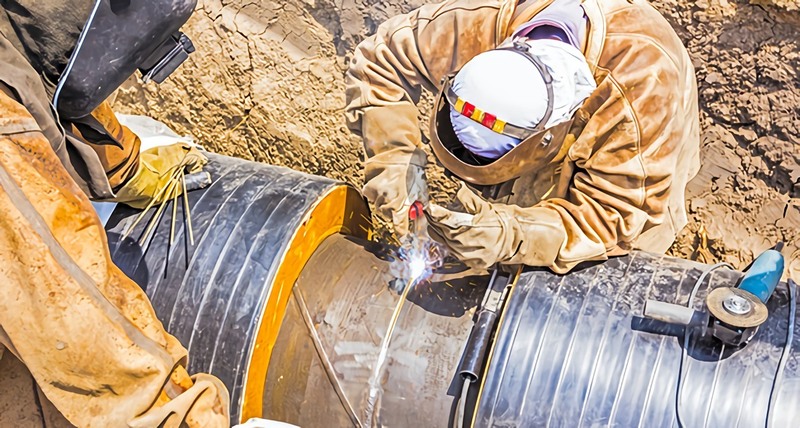 Professional welders usually work in tandem with pipefitters on commercial construction sites during installation of complicated circulation systems for liquid, steam or gas. Since residential construction typically is much less complex than commercial projects, a welder/plumber/pipefitter team is not always necessary, even when installing extensive residential pipe systems. While there may be hundreds of feet of piping in larger residential homes, that number pales in comparison to the potentially thousands of feet of piping required in many commercial buildings. While the required skills and applied techniques essentially remain the same, the site and scope of a welder’s work typically become larger at commercial construction sites. Welding training at TWS involves about 80% hands-on training and limited classroom study, offering experience in most popular types of welding. Students learn valuable techniques used with SMAW, MIG, TIG, flux-core and high frequency TIG welding variations. These skills are valuable in both residential and commercial construction. Professional welders, knowing the differences between residential and commercial construction, can aim to work in either environment—or both.